'Normandy Four' call on combatants in Eastern Ukraine to pull back heavy weapons. Reducing tensions and putting mechanisms in place to prevent more bloodshed in Ukraine's conflict zone remains at the top of the agenda of the four European powers that negotiated the Minsk I and II agreements designed to end hosilities. 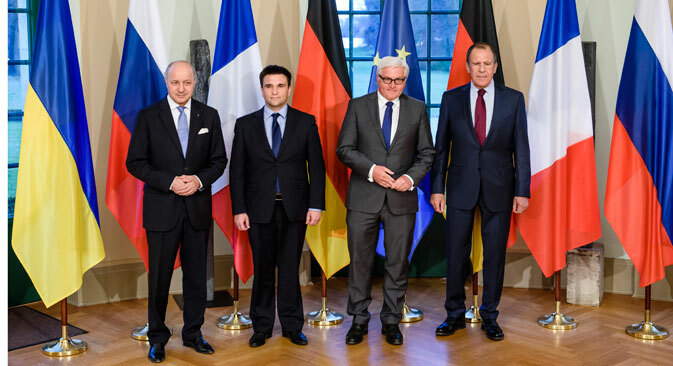 The foreign ministers of the so-called Normandy Four (Russia, Germany, France, Ukraine) want to see heavy weapons pulled by from the frontlines by all parties to the conflict. At a Berlin meeting April 14 they urged both Ukrainian army formation and rebels in the Donbass to remove tanks and all heavy weapons and mortars below 100 mm in caliber. The call comes amid escalating violence, jeopardizing the ceasefire in the Donbass. The statement, at the latest four-party meeting, follows the logic of the Minsk agreements, experts say. Russian Foreign Minister Sergey Lavrov, said the call supported an OSCE (Organization for Security and Cooperation in Europe) proposal to consider withdrawing weapons of less than 100 mm in caliber, as well as tanks, in addition to those types of weapons that already had to be withdrawn under the Minsk agreements. “The Russian side, through our representatives in the joint coordination and control center, proposed doing this a month and a half ago, and now that this is supported by the Normandy Four – I think is a very important achievement,” Mr. Lavrov said. The ministers also signaled initial support for a Russian proposal to address a significant increase in the number of ceasefire violations, in particular, in the region of Donetsk Airport. In a report made by the UN Office for the Coordination of Humanitarian Affairs, it was noted that information about the armed clashes “continues to arrive on a daily basis from different areas of eastern Ukraine, and in particular, from the vicinities of Donetsk, Lugansk, and Mariupol”. Denis Pushilin, permanent representative for the DNR (Donetsk People's Republic) for talks in the contact group, told RIA Novosti that the self-proclaimed republic is prepared to withdraw tanks and weapons of less than 100 mm in caliber from front lines. In an interview with RBTH, Sergey Utkin, of the European Policy Studies department at the Russian Academy of Sciences' Institute of World Economy and International Relations (IMEMO), said the warring parties in the Donbass are currently not fully complying with the cease-fire because a significant number of heavy weapons, not covered by the Minsk Agreement, remain at the front lines. “The new demand of the Normandy Four is not an act of desperation. This is the next logical step. The goal is the withdrawal of all heavy weapons from the front lines,” he said. Alexander Gushchin, an associate professor at the Russian State University for the Humanities (RSUH), told RBTH that the situation in the Donbass has not yet fully stabilized, and the conflict could flare up again. “A rather critical moment is approaching," he said. "There is this feeling that the Ukrainian side is not interested in maintaining the current truce. In addition, certain ambitions are being felt from the side of the self-proclaimed republics." Nevertheless, at the Berlin meeting, according Mr Gushchin, there was one positive achievement: “No breakthrough decisions were made – but, Europe has retained its role as a mediator and did not take a one-sided pro-Ukraine approach”. In Berlin, Ukrainian foreign minister, Pavlo Klimkin, again raised the question of an international peacekeeping contingent for the Donbass, although he failed to win support for the idea. Russia said that any discussion on peacekeepers remained premature. The experts agree that either the Minsk Agreements are implemented or there will be a renewed escalation in the violence, which may lead to Russia changing its position on how to achieve peace. “For now, Moscow’s position is based on the hope that the Minsk Agreements will be implemented. It is too early to talk about bringing in peacekeepers,” Mr. Utkin added. Mr. Gushchin of RSUH holds a similar view. He notes that Moscow is in favor of the Donbass remaining a part of Ukraine, subject to the Kiev government introducing constitutional reforms; bringing in international peacekeepers could result in freezing the conflict.